Alfiyyah Hasanah, a fifth semester student from the Mathematics Department, Faculty of Mathematics and Natural Sciences, Bogor Agricultural University (FMIPA IPB) claimed that she was worried about the placement of boxes or charity facilities that are part of the zakat, infaq and sedekah (ZIS) institutions in the city big city of Indonesia. According to him, this can be more optimized by placing it in a more strategic location. Drive-thru or non-descending service is a type of customer service that does not require customers to get off the vehicle. Not only for business, this system has also been applied in social matters such as the ZIS drive-thru facility which can be found around mosques in big cities. "I took the case of the ZIS drive-thru institution. When seen, its presence in Bogor has been counted a lot but its placement is still far from most people passing by. So few know and less efficient, of course. From that, I came up with the idea to maximize its layout using graph theory, namely the Center of Graph, "Alfi said. 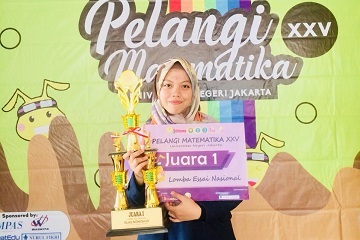 Gagasan tersebut ia ikutkan dalam lomba esai Pelangi Matematika yang merupakan rangkaian kegiatan dari Festival Matematika dan IPA yang diselenggarakan oleh Badan Eksekutif Mahasiswa FMIPA Universitas Negeri Jakarta (BEM FMIPA UNJ), (13/9). At first he had doubts if the idea would be considered by the jury. "Other participants represented their work well. "I didn't expect the jury to choose my idea as the first winner," he said.